This luxury 5 bedroom villa is set in its own private grounds with pretty landscaped gardens, and its own swimming pool. The private villa has many terraces with stunning views over the surrounding area and is also close to the beach, local beach side restaurants, and the town of Nathon. Set in the Gulf of Thailand, this island provides exceptional beaches and a lively night life. Maleesalan is an ideal location for exploring the spectacular island, and is the perfect base for those wanting to combine relaxation and golfing activities. Maleesalan is also the perfect base to explore other surrounding islands such as Koh Tao (ideal for diving), and Koh Phangan Home of the world famous 'Full Moon Party'. Wifi is also available from this part of the villa as well as inside. There is also some office facilities down stairs if needed. The kitchen is fully equipped to European standards, with a hob, griddle, microwave, toaster, kettle, cold water dispenser, and 2 fridge/freezers. Drinking water is provided FREE of charge, each bedroom has 2 bottles of water FREE per day. The Kitchen and the 5 bedrooms are air conditioned. MALEESALAN is furnished to a very high standard to ensure your total comfort. On site, property management, security, maintenance, and FREE daily cleaning will ensure that the Villa is kept to exacting standards. All linen and towels are changed weekly and the Villa is thoroughly cleaned at each changeover. Towels are provided in all Bedrooms, and beach/Swimming pool towels are provided FREE for guests use. We prefer our housekeeper to do personal laundry, the charge is 50 Baht per kilo - returned to guests laundered and ironed, same or next day. We do have an iron and ironing board. Cars are parked to the side of the main entrance and a short flight of steps provides access to the main living area. The high season is from mid December until beginning of April, summer season is from May to late September. Seasonal temperatures range from 25°C up to 35°C. The villa would make the perfect setting for a wedding, and a place to stay for a small wedding party or a centre for hosting small scale conferences/retreats/workshops. NOTE: IF YOU REQUIRE ALL 5 BEDROOMS, YOU MUST PAY THE £350 per week (£50.00 perday) EXTRA SURCHARGE FOR THE (entire)3rd FLOOR MASTER BEDROOM SUITE. If you have a special request please ask and we will try to fulfil your request. The cosmopolitan town of Nathon is only 7 minutes drive away. Koh Samui is the third largest island of Thailand after Phuket and Koh Chang. Thanks to Samui International Airport, Samui can be reached within an hour from Bangkok. Samui has everything to offer, from relaxing on white sand beaches to pristine jungles to a vibrant nightlife. It has different beaches of different landscapes and characteristics but the popular ones are Chaweng, Lamai, Bophut & Maenam; Lipa Noi is the nearest sandy beach to Maleesalan, and is perfect for adults and children. A variety of restaurants of all flavours and nationalities provide the invite for delicious dining. 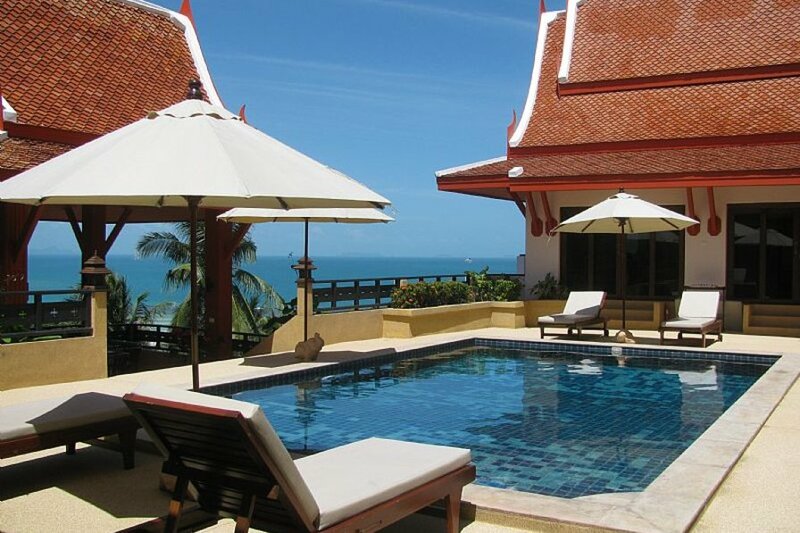 Those who enjoy pampering and rejuvenating will find Samui a paradise of spa and massage. Activities for relaxation, adventure or family abound such as elephant trekking, sailing, diving, and golfing. Sightseeing activities include, to name but a few, waterfalls, temples, butterfly garden, tiger zoo, monkey theatre, magic garden, paradise bird park, aquarium, elephant safari, big buddha, muay thai boxing, and numerous lively bars; all are waiting for you. Samui has a tropical monsoon climate, it has hot, dry and wet seasons. The temperature on the island is pleasant with the sunshine all year long so you can put away your jumpers. The rainy season is nothing to worry about as it normally lasts 30 - 60 minutes a day. You will be greeted by the sunshine before and after the downpour. Santiburi Golf Course Thailand.18 hole golf course in Samui stretching along the hills of the northern coastline offering spectacular elevations changes from 25 to 180 meters above sea level. Samui normally recognized for its white sandy beaches and relaxed atmosphere, is blessed with Santiburi designed to meet international standards as Thailands new golfing destination. Maleesalan has just had renovations and painting carried out on the outside of the Villa as well as repaving around the pool and Master Bedroom Suite balcony. There are panoramic views out towards the National Marine Park, towards the port town of Nathon, and towards the Hillsides. You can sit in the sala and watch the sunset over the distant shores of the Main land. Minimum booking is for 1 week unless other agreements have been made with the owner.